I've been looking forward to reading this since I first heard about it last year - so I was very excited to receive a copy for review. I loved the idea that it wasn't paranormal - there's a mysterious school, strange things are happening and we don't know who to trust - it was all very intriguing and appealing - and the fact that it's not paranormal makes it fresh and different. Don't get me wrong - I love paranormal stories - but I absolutely adored the fact that this one wasn't. The whole story kept me guessing. It was completely unpredictable and Daugherty managed to surprise me on many occasions. I didn't know what to expect - and I loved how characters you thought you knew became completely different people. I really enjoyed the whole mystery element - I spent so much time trying to work out what was going on (but failed miserably) - and I loved how it all turned out. And I like how we have many questions that still need to be answered - I can't wait to get those answers. Plus the story is set near to where I live so that is a nice added bonus. I adored Allie. I loved how she grew in the story - she's a much stronger character by the end of the novel. And Carter West is officially my new YA crush! The two of them together is just brilliant - the way they fight but also have a connection is really sweet. Plus that scene in the lake where he helps her? Loved it! All the characters in this are fleshed out and play important roles in the story. I really liked Jo and Rachel, plus Lucas and Lisa. Sylvain annoyed me but may have redeemed himself at the end. And I really liked the headmistress Isabelle. While I prefer first person narrative - and can't help thinking I would have loved the story to have been written that way - I soon found myself lost in it. We get the story mostly from Allie's perspective anyway and there is a very accessible quality to Daugherty's writing that made this a joy to read. There are some fantastic action scenes - the hold your breath kind - but these are balanced with some tender moments too. I'm certainly looking forward to more - and definitely more Carter West! I loved this book too! I can't wait for the next one. I have brought this on your recommendation. I hope I like it! I didn't know this wasn't paranormal. Thanks for the great review! Fabulous review! 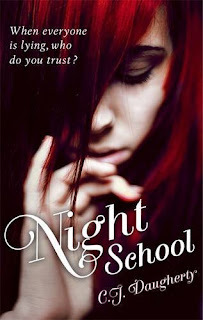 Night School sounds like an awesome book - am surprised that it isn't paranormal though! I assumed it was!